Bathing your dog regularly is important for a whole host of reasons, especially with dry shampoo for dogs. It removes detritus which can build up and become uncomfortable in their coats, it helps protect them against fleas and other parasites, and, vitally, it stops muddy paw prints being tracked through your home. However, getting and keeping your canine companion in the tub can be far from easy. Jokes about the gargantuan task of bathing a reluctant dog abound, and it can sometimes be a two or even three-person job! On top of this, some dogs are frightened of water and find bathtime extremely stressful. Luckily for those of us with pooches who are hydrophobic – or just plain naughty – pet grooming companies have come to the rescue by creating dry shampoos which can be used to clean the coats of our furry friends. These formulas are applied directly to your dog’s coat and don’t require any rinsing, making them a convenient but effective alternative to a traditional bath. These shampoos are also a great option to use between baths, reducing the number of baths your pet has to undergo and keeping their coat fresher for longer. There are plenty of canine dry shampoos out there to choose from, so we’ve compiled a list of the ten products we think are the best. Hopefully our reviews will help you track down the perfect bathing alternative for your dog. We’ve also addressed some common questions about what your options are, how to use these shampoos, and how they work. 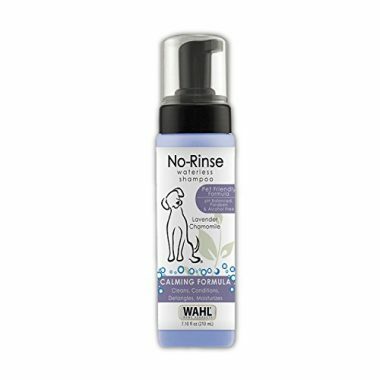 Wahl’s no-rinse shampoo is available in two different scents; lavender and chamomile, and coconut and lime verbena. Both options will leave your dog’s coat smelling fabulously fresh, whilst the carefully crafted formula gets to work. 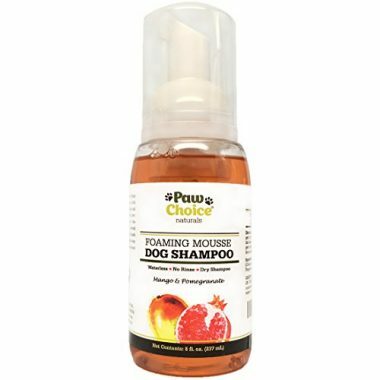 The shampoo is perfect for use between regular baths, and effectively cleanses dogs’ coats with natural, plant-derived ingredients. The formula also contains guar conditioner, which works to lock in moisture in your dog’s skin and hair. Whal’s formula is a foam, which can be easily rubbed into your pet’s coat, and subsequently brushed out – totally water-free. This shampoo is the perfect option for owners who want to give their dog a quick spruce up, without resorting to harsh chemicals. Customers say that the gentle scent is also a winner, covering up the vast majority of less than pleasant doggy smells! This doggie dry shampoo refreshes, deodorizes, and conditions your best friend’s coat – all without involving a single drop of water. Paw Choice’s formula, derived naturally from coconuts, is mild enough to be used on sensitive skin. Since it’s free from sodium laureth sulfate, it won’t irritate the sensitive skin of owners either. 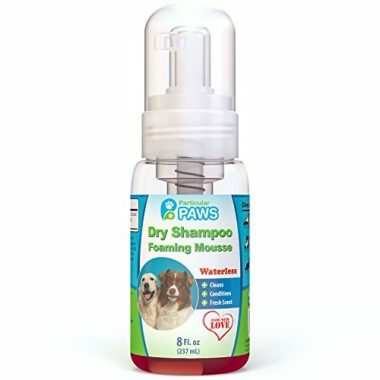 Paw Choice recommend using their foaming dry shampoo on senior dogs, dogs who don’t like water, or between washes to keep those more pungent pets smelling fresh. The formula actually kills odor causing bacteria, rather than just masking smells, and replaces these odors with an easier on the nose blend of mango and pomegranate. All of Paw Choice’s products are formulated and manufactured in the USA, and come with a 30 day satisfaction guarantee. With their pun name and effective, natural product, Pawstruck have earned themselves a spot on our list with their brand of spray-on dry shampoo. The formula can be used on both cats and dogs, and caters to every type of skin, hair, and fur. This gentle shampoo not only cleanses your pet’s hair and skin, it also helps to reduce any inflammation on their body to promote better healing. It smells great, too – a light citrus scent will accompany your furry friend wherever they go after a few spritzes of Pawstruck. This blend is also vegetarian and vegan friendly, which is a great sign for animal lovers of all dietary persuasions. It also naturally kills off the bacteria responsible for bad odors, leaving your pet smelling fresher for longer. Formulated and made in the USA, Pawstruck offer a high quality dry shampoo that’s gentle on the skin and can be used on any pet. 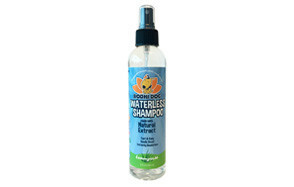 This waterless dog shampoo is easy to use and can simply be sprayed in and left in your pet’s hair. It’s ideal for use in between baths, to help keep your pet’s coat healthy and shiny. Bodhi Dog’s formula is 100% non-toxic, and suitable for all skin types. The shampoo also has the advantage of being hypoallergenic, and alcohol-free, so no need to worry if your pet accidentally ingests some. Each ingredient is also vegan friendly and ethically sourced, plus the packaging is fully recyclable. Like many of the products on our list, it naturally but effectively kills off odor causing bacteria, keeping bad smells at bay rather than covering them up. Available in both lavender and lemongrass scents, Bodhi Dog’s gentle formula also leaves a refreshingly natural scent in its wake. Vet Recommended, as its name suggests, is recommended by a number of US vets! Their dry shampoo is easy to use; simply spray, wipe down, and allow to dry. Its hypoallergenic formula is suitable for use on other pets too, including cats, rabbits, and even ferrets. Since it doesn’t contain any alcohol, the mild blend will not strip your furry friend’s coat. Instead, it leaves pets’ hair silky soft, imbued with the fresh scent of apple extract. Odor causing bacteria are wiped out too, allowing the pleasant scent to really last. Another advantage of this shampoo is that it’s specifically tailored so as not to interfere with topical flea treatments. This makes it the perfect option for the summer months, when fleas and ticks are at their most active. Vet Recommended offer their customers a lifetime satisfaction guarantee, which just goes to show how much they believe in their product. 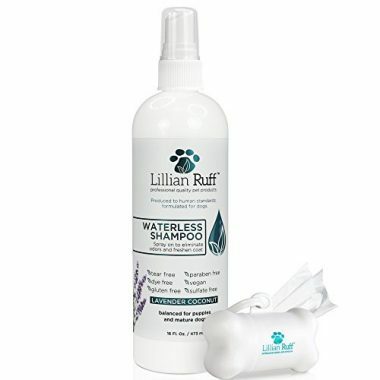 Lillian Ruff’s dry shampoo for dogs offers your canine companion an easy way to get refreshed between baths. Their formula can simply be sprayed on and left in, without needing any brushing or rubbing. This means it’s probably the easiest to use shampoo on our list! The shampoo contains lavender and coconut oils, both of which naturally help keep skin in tip top condition. On top of this, lavender is a proven flea and tick repellent – keeping the little pests away the natural way. Lillian Ruff’s blend also includes soothing aloe extract, which is great for moisturizing your dog’s skin and coat. Because of its gentle, naturally sourced ingredients, this shampoo can be used on sensitive skin too. Lillian Ruff’s vegetarian and vegan friendly products are made with quality ingredients in the USA. 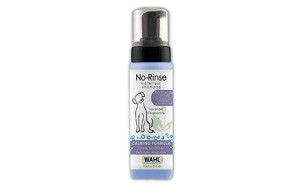 This foaming shampoo refreshes, conditions, and deodorizes your dog’s skin and coat without the need for water. Paw Choice’s gentle, soothing formula centers around moisturizing coconut extract, but also contain lavender for a pleasant scent and to repel fleas and ticks, and chamomile to calm the skin. This natural blend leaves behind a great scent, which keeps your dog’s coat smelling fresh between washes. Free from alcohol, parabens, and sodium laureth sulfate, this shampoo is suitable for dogs of all skin types – even pooches with sensitive skin. This gentleness doesn’t prevent the shampoo from being effective, however – it kills odor causing bacteria, rather than just masking the smells they cause. 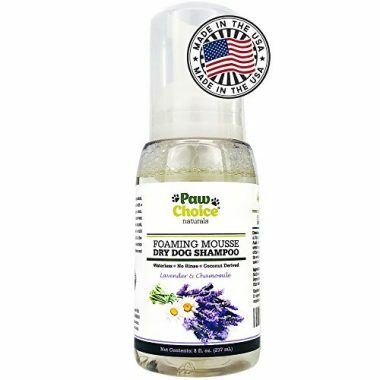 Paw Choice products are manufactured with great quality ingredients in the USA. 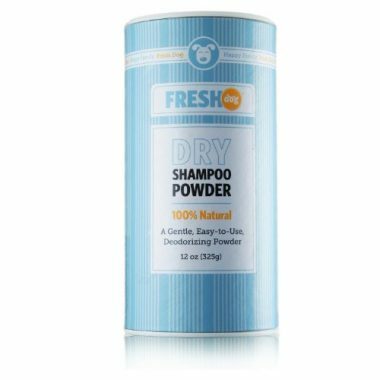 Fresh Dog’s dry shampoo produces exactly what the tin promises – a fresh and clean pooch. Unlike the other blends on the list, this shampoo comes in the form of a powder. Some owners might find this easier to use, but for others it could get a little messy, especially if your dog wriggles around when you pet or groom them. It contains 100% natural ingredients, which deodorize your pet’s coat without stripping it. It’s also safe to use alongside topical flea treatments, and won’t stop them from working. The gentle blend is suitable for dogs of all skin types, and it’s free from parabens, dyes, and other synthetic ingredients. Because its pH is designed to mimic that of your dog’s skin, it won’t interfere with their natural skin chemistry either. Finally, one particularly useful feature of this product is that it can be used around the house too. Simply sprinkle a little powder on the carpet or your pet’s bedding, leave for a moment, and vacuum up, to effectively deodorize the spot. It will leave a refreshing lavender and rosemary scent in its wake. 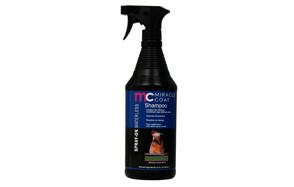 Miracle Coat offer great value for money with their easy to use and effective dry bath for dogs. 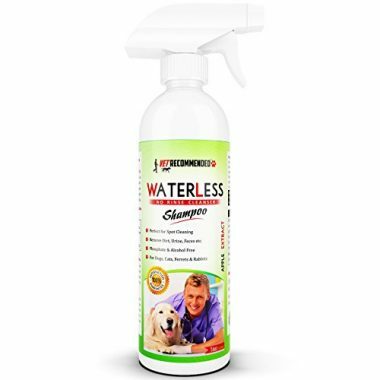 This spray on formula contains all natural ingredients, and can be used by simply spraying onto your dog’s coat and waiting, before giving them a quick towel dry and brush. Herbal extracts help to improve the condition and appearance of your dog’s coat, without irritating even sensitive skin. The bottle itself is also designed to make the bathing experience as stress-free as possible. The spraying mechanism is noiseless, so allowing flighty dogs to be bathed much more easily. The meadow fresh scent leaves your furry friend smelling fresh and clean between washes, and can help cut back on scratching too, since it acts to sooth dogs’ skin. And there you have it – the best dry shampoo for dogs on the market right now. We know that since the pet grooming market has really taken off in recent years, it can be difficult to know exactly which product is right for your pet. This is especially true when it comes to dry shampoo, since so many of them have quite similar features! That’s why we’ve put together this handy guide, which we hope will answer some of your major questions about dry shampoos for dogs, and help you decide if this relatively new product is right for your pet. To help you choose the right option for you, we’ve outlined a few key things you might want to bear in mind when choosing a dry shampoo for your canine companion. If you’re currently using a topical flea and tick treatment – such as a spot on gel, collar, or shampoo – make sure you choose a formula which doesn’t interfere with it. Most manufacturers will advertise this, including many on our list. Some shampoos also contain lavender extract, which is a natural flea and tick repellant. All of the shampoos on our list use natural ingredients wherever possible, but not all brands do. If your dog has sensitive skin or is prone to itching and redness, choose a brand which suitable for their skin type. These often contain a soothing ingredient such as aloe to help keep skin calm. Although it might seem superficial, it’s important that you and your dog actually like the smell of a product you’ll be regularly using. Since the products on this list use a diverse variety of scents, it should be easy to find one that you like. Dry shampoo can be a handy product to have around, but not all dogs will necessarily benefit from it. Below are some key examples of dogs who could really benefit from a dry shampoo, making it a sound investment. Ideally, dry shampoos should not replace regular baths altogether. However, they can still be a great option for water adverse dogs, since using a dry shampoo in between wet washes will reduce the frequency with which you need to bathe your dog. For dogs with sensitive skin, using a gentle formula which utilizes natural ingredients is the best idea. You might also consider combining this with the occasional use of oatmeal shampoo for dogs. Oatmeal calms the skin and helps prevent itching. As much as we love them, no owner can deny that some dogs can quickly become rather pungent! A dry shampoo can naturally deodorize your dog in a fast and convenient way. For older dogs, being hoisted into a bath can be a bit too much – especially if they’re tired or have arthritis. Using a dry shampoo can cut back the number of times they need to be bathed, saving stress and energy. Dry shampoos can be the perfect solution for when your dog gets muddy or rolls in something when they’re off on a walk. Before you let them back into your house and car, you can quickly remove the detritus (and the smell) with a dry shampoo. Whilst dry shampoos for humans tend to only be available in powdered form, our canine counterparts have four options to choose from! Whether you choose a powder, spray, foam, or gel, will be mostly down to personal preference. Spray shampoos are probably the easiest to distribute easily through your pet’s coat, foam shampoos tend to achieve the best lather, and powder shampoos are versatile enough to be used on your pet’s bedding and carpets too. Gels land somewhere between the foam and spray options, and are usually best for pets who are more comfortable being touched, since a lot of contact will be needed to distribute it over their body. Q: How do dry shampoos work? A: Most dry shampoos work by absorbing the excess oils and grease which accumulate on a dog’s coat. Powder dry shampoos use starches or clay to soak up these chemicals. Foams, gels, and sprays, on the other hand make use of gentle surfactants – the same type of chemical used in face washes and other cleansers – to break down these oils so they can be rubbed or brushed away. The gels, foams, and sprays also, essentially, ‘rinse’ away detritus such as mud and leaves. Some dry shampoos also contain plant extracts which kill odor-causing bacteria, leaving your dog smelling fresh. Q: Are dry shampoos for dogs safe? A: As long as you follow the manufacturer’s instructions, and don’t use dry shampoos as a complete replacement for traditional baths, then yes; dry shampoos for dogs are safe. Always be sure to check the ingredients list for any components your dog is sensitive to, and do not over-use the product. Removing too much oil from your dog’s coat can make them more susceptible to flaky skin, and even illness, since this naturally occurring oil is their first line of defense against pathogens. Q: How often should I use dry shampoo for dogs? A: How often you wash your dog, by any method, depends very much on their breed and lifestyle. Active outdoor dogs will need to be washed more than those who usually hang out at home, for instance. Dogs with normal skin should generally be bathed about once a month. 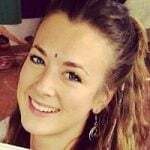 Using a dry shampoo to supplement this routine, you might be able to bathe them every month and a half, and use the dry shampoo every week or so. Dogs with dry skin should be bathed less often – around every two or three months. If in doubt about your dog’s bathing routine, speak to a veterinary professional. Our prize for the best dry shampoo for dogs has to go to Wahl! Their gentle, foaming formula is convenient to use and does everything you need it to at an affordable price point. Available in both lavender and lime verbena scents, their blend will leave your pet’s coat soft and shiny no matter what your preferences. It’s the perfect way to spruce up your dog’s coat without resorting to harsh chemicals, and also has the bonus of leaving it in great condition thanks to its guar conditioner. 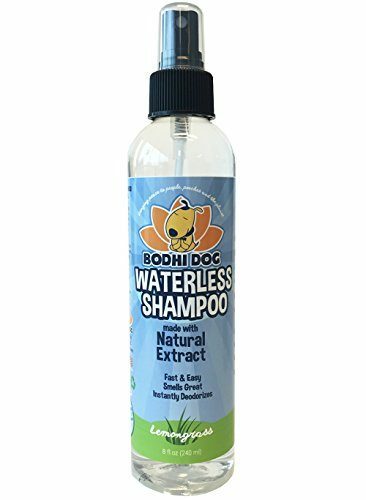 Overall, we think this handy product is the best waterless dog shampoo.